Horse racing was an especially popular sport with royalty, the aristocracy and the gentry during the eighteenth century. Its origins go back well beyond that time, though earlier races tended to be simple challenges between two riders and their horses. James I began racing his horses for fun by 1605, choosing the obscure Cambridgeshire village of Newmarket to do so. He spent so much time on the sport that parliament had to petition him to give greater attention to the business of state. Where royalty led, the aristocracy were never far behind, especially in matters of pleasure and gambling. By the reign of Charles I, regular race meetings were being held at Newmarket, as well as elsewhere in the country. Cromwell suppressed public races and the gambling that went with them. Charles II, naturally, brought them back and became a devotee. He even took part as a jockey. At the start of the eighteenth century, Queen Anne kept many horses and encouraged the establishment of regular racing at Ascot. It was in the mid-eighteenth century that racing assumed its modern form. Several of today’s ‘classic’ races were first run then, such as the Derby, the Oaks and the St. Leger. However, this post is concerned with later developments and how they affected Norfolk. It was in the mid-eighteenth century that racing assumed its modern form. Several of today’s ‘classic’ races were first run then, such as the Derby, the Oaks and the St. Leger. The Jockey Club was also established (in 1750) to regulate the sport and establish codified rules to govern how it should be organised. As was the system of handicapping still in use today. 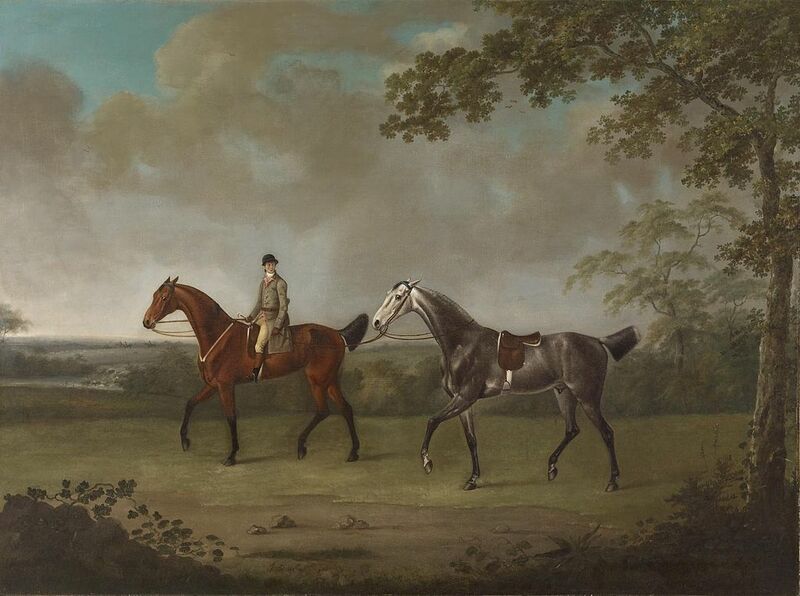 By 1762, certain horse owners were officially able to register their jockeys’ racing colours or ‘silks’. It’s interesting to note that the original list contained no less than seven dukes, one marquis, four earls, one viscount, one lord, two baronets and only three plain ‘misters’. If not purely the sport of kings, breeding racehorses was pretty much a preserve of the aristocracy and wealthier gentry. Not really surprising, of course, given the huge costs involved in owning and training a string of suitable thoroughbreds. Gambling, naturally, was open to anyone with money and nerve enough. Nowadays, races are held at Great Yarmouth and Fakenham, but in the eighteenth century one of the principal meetings took place just outside the little market town of Holt, on land now occupied by Holt Country Park. This area was then part of a great swathe of heathland that virtually surrounded the town to the east and south — a stretch deemed largely wasteland, save for a few rabbit warrens and some miserable sheep. Racecourses were often established on such land, because they were thought useless for agriculture, were relatively easy to clear from excessive vegetation and had sandy soils that made good racetracks. Mr. Bullock’s Bay Gelding, Nimrod, rode by himself. Col Townshend’s Chestnut Gelding, Forester, rode by Mr. Walker, was distanced in the first Heat. The Company on the Ground during the whole Time of the Races was very numerous and splendid; there were near a Dozen Coaches and Six, most of the horses Bays or Chestnut, and all with grand Equipages, besides a multitude of Post-Chaises, Coaches and Four, Chariots, Berlins, Phaetons, Chaises, Flys, etc. The Assemblies were very brilliant, and a Subscription was opened for the Next Year’s races at Swaffham. On Wednesday the 17th Inst. Will be run on Holt Race Ground, a Match for One Hundred Guineas between two capital Hunters. After which Saddles and a Five Pound Cup will be given gratis to be run for by any Horse, Mare, or Gelding, not having won or started for a larger prize. Every Horse, &c. Must be entered at the Bar of the Feathers Inn, Holt, before Ten o’Clock in the Morning of that Day. An ORDINARY at the Feathers. HOLT ASSEMBLY will be on Tuesday, the 16th of September next. Tickets to be had at the Feathers Inn, at 3s 6d each, Tea and Cards included. The RACES the next Day. Holt features several times in my books about Dr Adam Bascom. In the eighteenth century it was a rather more important place than it is today, with a regular market for the area round about. It was also the meeting place for the local magistrates and Overseers of the Poor, as well as being the starting point for various coach routes, including Norwich and London. Interesting! Do I suspect a real horse race in a future book? Just a note of thanks for your books and these delightful insights into the past. Thanks. I’m glad you like them. Have a great Christmas.